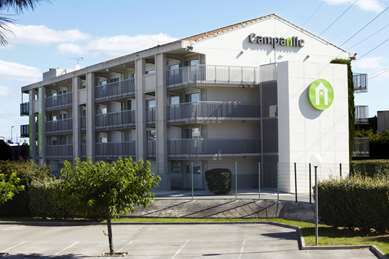 Stay at our budget Hotel Première Classe Montpellier Est -Parc des Expositions -Aéroport near the beaches of Carnon and Grande-Motte. 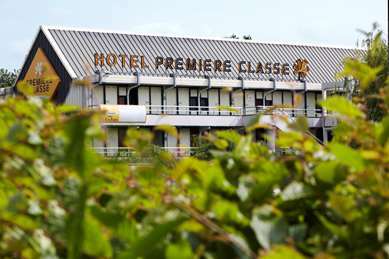 Our Hotel Première Classe Montpellier Est - Parc des Expositions - Aéroport is ideally located 2 minutes from Highway A9 (exit 29). You will be near the Carnon, Grande-Motte and Palavas beaches, as well as the Parc des Expositions, and the Aréna and Zénith theaters. You can use tramway line 4 to easily reach the Montpellier city center to attend numerous internationally renowned festivals (FISE, Montpellier Danse, etc.) 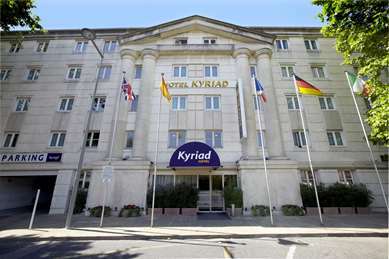 and visit the historic heart of the city with its must-see venues such as the Fabre Museum or Odysseum. Located a few minutes from the 3 major Montpellier shopping centers, our establishment also offers various restaurant options very nearby Are you here for a family vacation or business trip? Come enjoy the nice weather out on our terrace in the shade of the laurel trees. Reception is open 24 hours a day, 7 days a week. The entire team at Hotel Première Classe Montpellier Est will give you a warm and personalized welcome throughout the year and hot snacks are offered at any hour of the day. For your safety, free private parking with surveillance is offered. You can surf the web using a free secure Wi-Fi connection. We offer 48 renovated rooms for reservation in double, triple or twin configurations. 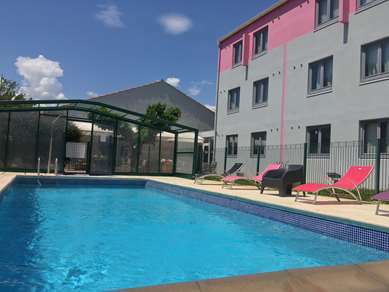 Each room has a flat-screen TV with Canal+ and CanalSat channels, a desk, a clothes hanging area and secure free Wi-Fi access. 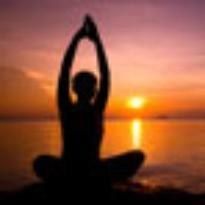 Our rooms are also equipped with a washroom with shower and private toilet. All our rooms are air conditioned. Hotel Première Classe Montpellier Est has 2 specially adapted rooms for people with reduced mobility.